By Xah Lee. Date: 2017-07-11 . Last updated: 2017-09-13 . 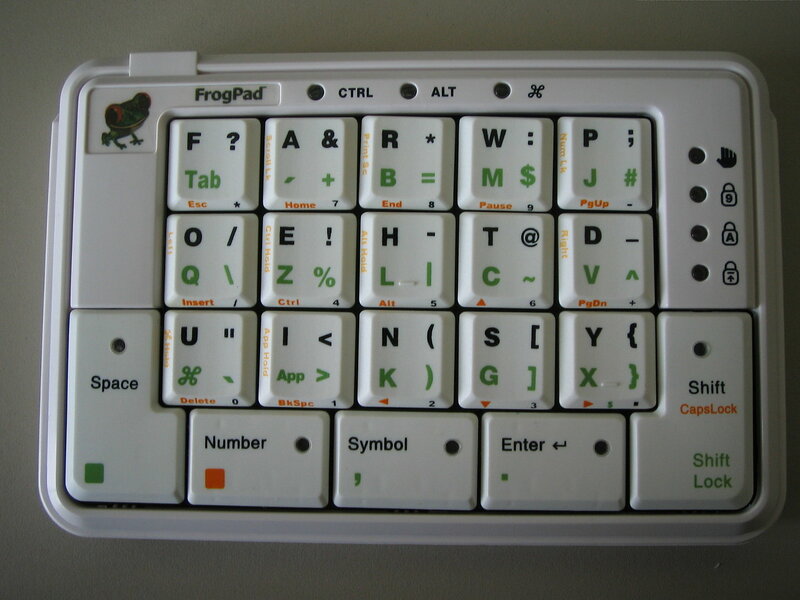 Frogpad is a chorded keyboard, designed for one-handed typing. You press key to enter a letter. For some letters, hold the thumb key (colored green) and press a letter key. Punctuations is done by holding the middle bottom key. There are right hand and left hand version. They are mirror images. It's not available now, as of 2017-07-14. You can find them on ebay. The story of frogpad seems went up and down. It started, and another guy got the right to sell it, but ate the money, now the original guy got the right back, and may be making it again. There's no company website now. Whatever you see may not be what it is. The founder and CEO of the company was Linda Marroquin. She left the company in 2008 The original FrogPads on the market at this time were intended to be used with mobile phones, and supported only Bluetooth. 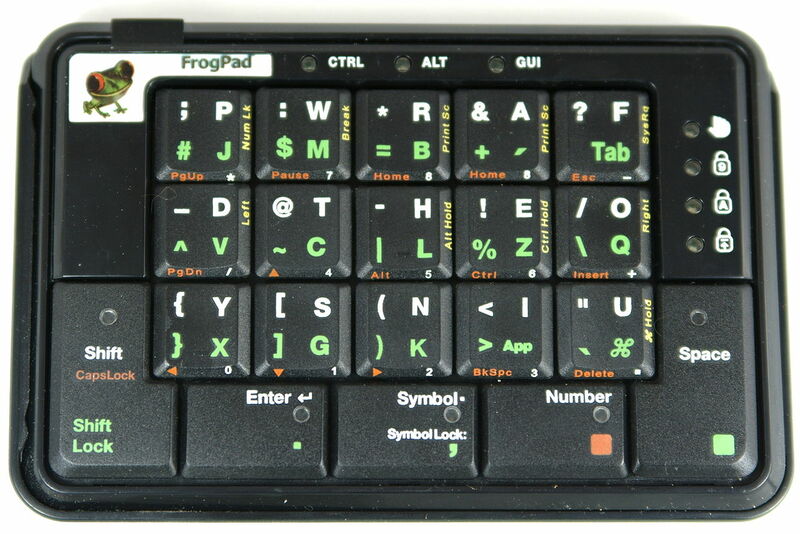 Two attempts to relaunch the Frogpad had been made. The first was made in February 2012 by Frogpad and Linda Marroquin. However, due to funding difficulties this launch was cancelled and the cost of pre-ordered units was refunded to customers in June 2012. The second relaunch attempt was made by Andrew Taylor of IT consulting firm Satori Tech Solutions and began to advertise in November 2013 and solicit pre-orders in January 2014 for a “prototype” version to be delivered in February and a final production version in April of that year. However, neither version of the keyboards shipped, and a post on the company Facebook page from 20 May 2014 states that they “… WILL NOT ship a product I can't be proud of that lives up to what all of you expect and deserve.”. Since then, the company has ceased communication.